Discussion in 'Survival Server Discussion' started by ItsAZZA, Jan 14, 2015. 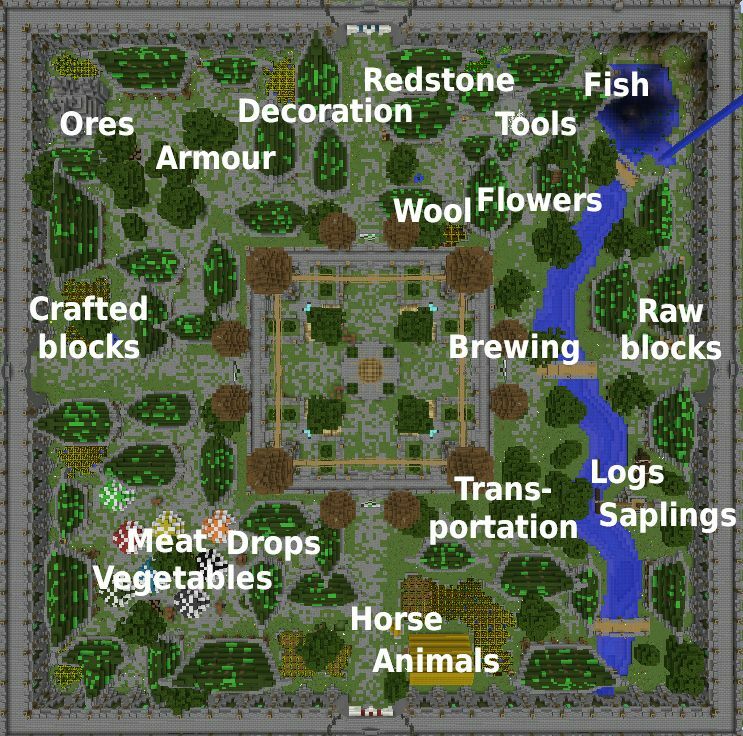 On the survival server there is admin shops all over the spawn region, I have created a map for you to find the blocks/items you need. Here is the full list of items the admin shops are selling at spawn. You can get to spawn from anywhere by typing "/spawn". Down below is the map, if you have not seen it yet. North is up in this picture. DoctaCirno, Jessie and JeremyC lick this. I love survival, it is now popular and much more fun. As my friends now go on it, we can play together, meaning it is enjoyable for all of us. I'm glad we can start afresh, no more soul sand! I can build up the survival group once more, meaning we can expand basses. Now I actually have something to do on survival. I would just like to say, thanks to staff for making this happen. Without AZZA Quick Or any of the staff, this wouldn't of happened! Just thought, I'd let the staff know I am thankful, and I am sure everyone else is too! More coming soon. Staff, keep a look out please! The custom biomes idea was scrapped because of the lack of interest in the community. Aw that's too bad. I thought it was a pretty nifty idea. I CANT FIND THE LOGS SHOP where did it go? Lol when I posted that, the villager who sold em disappeared but Azza reloaded him days ago so it's all good.